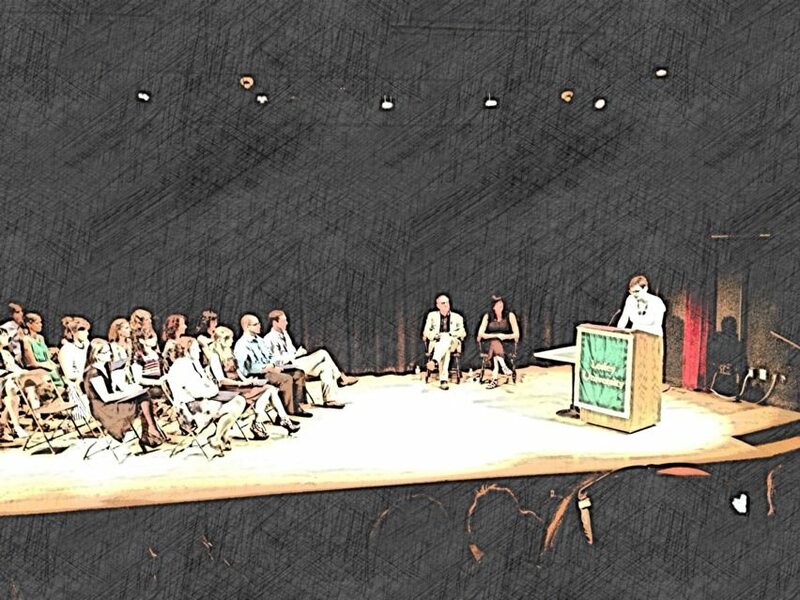 On June 29th I had the honor and delight of addressing my graduating class at Lesley University’s MFA graduation ceremony. Writing a speech was one of the hardest writing tasks I’ve ever faced. For months I scribbled notes, e-mailed myself little tidbits, agonized over how my speech would compare to the beauty that’s come before me, and made crooked notes at three a.m. when I couldn’t sleep. No matter how difficult it felt, though, I always knew I’d come up with something good, if only because my muse–twenty-two writers and the two years we’ve spent together–was absolutely incredible. Below is the speech I gave, humbled and grateful and bright. Friends and family, faculty and students, and my beloved cohort –it’s an honor to be presented the opportunity to address you all here today. Thank you for being some of the most generous and outstanding people I’ve ever known. I consider myself really lucky, because I walked in here in June 2011, and for some fateful, awesome reason, so did all of you. Whenever someone asks me what’s best about this MFA program, I say, the people. You cannot ask for better people. Parents and family, please know that you have raised some truly fine human beings. Friends and partners, this is a reminder that you’ve hit jackpot. And to the children of any writers on this stage, you may not believe me, but your parents are terrifically cool. It occurs to me that Koch may never have met a low res MFA student like us. I think we’re pretty good at having all three. Part of what appeals to us low res folk is that we get to write without leaving our lives behind. We juggle rent jobs, children, spouses, exes, medical bills, college friends, surgeries, weddings, all five seasons of Breaking Bad, cats, mortgages, girlfriends, internships, and, above all else, writing. I only stand here today because I am so blessed by the trifecta of family, chosen and real, friends, and writing. And judging by the crowd, you all are blessed by this trifecta, too. Yes, we’d all write more if we declined invitations to birthday parties, lived alone, never had to see family on holidays—no offense– and had stretches of time before us in which to court the muse. But if that was the case, whatever would we write about? A friend of mine in New York was in a traditional MFA program, and when I asked her how it was going, she said, “I go to a lot of parties, and do a lot of drinking, but not a lot of writing.” If only she had been low res. The trick, I believe, is to stuff all of your parties and drinking into nine days twice a year here in Cambridge, then take the rest of the year to write. I will be the first to admit that if life were always like residency, if Matthew always lived down the hall, or Karalyn was always there when I came down for breakfast, or if, god forbid, I lived around the corner from Cambridge Common, I don’t think I’d get a lot of writing done, either. It’s what makes these residencies so sweet, the magic ingredient of absence making the heart grow fonder. From the moment we began our last semester here, there has been a lot of talk about not wanting to graduate. It’s really hard to think that this could be ending, this blend of deep friendships and generous mentors, the built-in deadlines, the soothing balm of student status. I’ve been thinking about it for a long time, this impending ending, and it’s lead me to an idea that I am going to earnestly propose today. It may be unconventional to give a graduation speech in which I suggest we all not graduate. But there’s nothing conventional about getting an MFA in Creative Writing, either. I’ve got it all planned out. There’s going to be a third year for us, and it starts today. Tuition, for this third year, is free. Deadlines will be the same, the first Monday of every month. And while this third year cannot afford us the loving guidance of our faculty mentors, we can press ‘send’ on manuscripts to each other. If we’ve done this for the last two years, why can’t we do it for one more? One more year of neglecting the yard work or the bathroom that needs to be repainted, one more year of living with a roommate while we work part-time, or rising at five a.m. to write before leaving for our day job. One more year of banging out drafts the day before they’re due. One more year of pushing ourselves, of cheering each other on, of sitting and doing that work that drove us here. To the friends, family and loved ones who’ve tolerated our incessant keyboard tapping and grumpy isolation, if you thought you were getting us back after today, I hate to say it, but you’re not. We’ve got work to do. That work has only begun. In my journey here I applied to seventeen MFA programs, and for a while I had my heart set on a three-year program, because I heard from writers that the third year is where the writing gets really real. The third year is where you hit your groove and the demons have loosened from your back and you can burst through the thin membrane between doing enough and doing your best. Gaining momentum takes three times as much energy as sustaining it. The plates are spinning on their sticks. I dare us to keep them spinning. Recently when I told someone I was graduating, they asked me what I was going to do next. This puzzled me, only because the answer seemed so obvious. What was I going to do next? The same thing I’ve been doing. I’m going to write. Yes, it can feel very silly to have a degree you do not run out into the world with. For us, the best place we can to run to is the desk. When you get home, before the suitcase is unpacked, before you open your mail, before you return that phone call or e-mail, write something. Honor what we have worked so hard to do here. Hold your home life at bay for just one hour, and write. It won’t be easy, but it’s our third year. Our first deadline is August 5th. You better get a jump start. I think of you all when I’m writing, because you are the first writers I met who showed me their writing selves. We never see writers writing, we only see them having written. In the past two years, when I have sat down to write, when the self-doubt begins to creep in, I take solace in the fact that somewhere in the world all of you are actively writing. The beauty of a low residency program is that there’s a wide constellation of us. I can picture Evan at a desk in his apartment in Pennsylvania, after work. I imagine that Ericka & Jasmine write on the same candy colored laptop that brightened every classroom we’ve been in. I think of Julie writing with a window nearby. Katie, I bet, writes in the morning; maybe Pheobe writes at night. I know that July likes at least one cat in the room in order to write. Wherever Clinton writes, I figure that it’s cold. Michelle, who worked on her thesis in an arm-chair late at night during AWP conference this year, could probably write anywhere. These imagined desks where you write — the rings from coffee mugs, the post its stuck to the wall, the bills shoved out of the way — they buoy me when my own desk — a fold out Ikea table in a corner of my small bedroom — seems too dark. When the writing seems too hard. I picture you all, your faces in the glow of your computer screens, your stubborn faith that we are doing the right thing, and then I can keep going. It is always with you that I will write. I will forgive Kenneth Koch’s limited view of writers having it all because he wrote a line of poetry that has rang in my head since day one. How Lucky To Run Into You When Everything Was Possible. How Lucky To Run Into You When Everything Was Possible. Excellent, Courtney. Take some time to be proud of yourself. Superb, keep those plates spinning, Courtney. Great speech, Courtney, and congrats on graduating!